1. Advance the education of the public in the subject of visual and performance art in all its forms. 2. Promote art for the benefit of the public by the establishment & maintenance of an arts festival. The main function of CASALF in 2015 remained to work with local communities to deliver a multi-disciplinary, culturally-diverse arts festival – COAST – in October half-term week. This and all other activities were underpinned by the principles of inclusivity, affordability and accessibility whilst, at the same time, promoting quality in artistic practice and fostering young/emerging Norfolk talent. July marked the launch of North Norfolk’s Great Talent aka #NNGT. A new endeavour for COAST, in full partnership with Arts North Norfolk (ANN) and Art is Medicine (AIM), #NNGT sought to encourage Norfolk’s hidden talent gems of all ages to come forward in 6 auditions and 2 semi-finals from 4th Sept to 16th Oct in Mundesley, North Walsham, Cromer, Sheringham and Holt. 15,000 leaflets (sponsored by AIM) were widely distributed in school book bags and community venues across the county. These were supplemented by 8 adverts in Just Regional and Times Group free publications, a new website – www.nngt.uk, newsletters to the COAST mailing list and press releases. There were 38 enquiries and these translated into 29 separate entrants (soloists, duos, bands and troupes). 21 of these went through to the semis and 10 were selected for the glittering Grand Final in Cromer Pier’s Pavilion Theatre on Thu 29th Oct, hosted by Joe Ballard, CEO of ANN. The finalists performed for a 205-strong audience and 4 prestigious judges: Anna Mudeka, Annie Lloyd, David Mackay and Roy Davenport. The winners, Angelo Bernal & Ryan Major performing as GELO, were awarded the unique #NNGT trophy (created by Annie Lloyd and sponsored by M&A Partners), £100 cash and an immediate opportunity to perform in David Mackay’s show The Elvis Years on Cromer Pier on 31st Oct as well as to record a special session at Mustard TV for broadcast on 3rd Nov. The success of #NNGT was overwhelming; key partners in its delivery are keen to expand and develop the project in future years and enquiries have already started coming in! COAST2015’s fundraising activities began in the summer with a Norfolk Treats Raffle and a Supper Quiz. (Unfortunately a planned summer Garden Party at Templewood in Northrepps had to be cancelled. This was a great shame as previous Templewood parties had been amongst COAST’s best supported and financially beneficial events, providing a great opportunity to sell raffle tickets too!) In recent years COAST raffles have proved popular with the public and cost-effective thanks to the generosity of local businesses. This year 16 prizes were donated by museums, shops, attractions, theatres, hotels and restaurants. Prizes ranged from a £15 gift voucher for hand-made chocolates to dinner, bed and breakfast in a boutique hotel. Ticket sales – £336 compared to £585 in 2014 – were a little disappointing but, with fewer selling opportunities (e.g. at Templewood), were not entirely unexpected. Although inexpensive to run, a big annual raffle is really labour-intensive. On 30th Sept the Supper Quiz proved successful in both financial and audience development terms. COAST had run quizzes in previous years with varying degrees of success. Competition in this arena is fierce and so in 2015 COAST wanted to offer something a bit special and so introduced the supper element (as opposed to the standard fare of sandwiches and chips). The Sea Marge Hotel in Overstrand (host of several Afternoon Tea & Talk events from 2012-14) proved an ideal partner. The hotel provided a choice of delicious home-cooked suppers for just £5 per head with the proviso that COAST would encourage its guests to purchase drinks and puddings as add-ons. COAST hoped the event would attract 40 participants paying £10 (in 10 teams of 4) but there were actually 56 paying customers. After costs, the quiz made a profit of £263 and £80 worth of raffle tickets were sold. The Sea Marge (part of the Mackenzie hotel chain) was delighted with the event and this enthusiasm is certainly something that the Trustees plan to build on in future years. Sheringham & Cromer Choral Society’s concert with London Mozart Players in Cromer Church on 28th Nov (the finale in North Norfolk District Council’s Orchestras Live 2015 season). 60+ public, private and voluntary sector organisations – pre-existing partnerships with funders, venues and/or contributors were consolidated and new partnerships were developed; most notably with Cromer Pier, Davenports Magic Kingdom and Structureflex. 125 volunteers (contributing an estimate of 8,000 hours equating to £88,000 at £11 per hr). 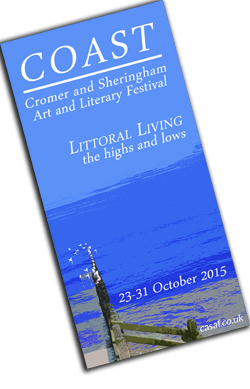 Promote a diversity of artforms & showcase the variety & quality of work produced in Norfolk. Provide access to high quality local, regional, national & international artistic practices. Offer local communities & visitors wide-ranging cultural & wellbeing experiences in this rural district where affordable opportunities are comparatively limited. These have certainly been achieved. In terms of affordability, 40% of all opportunities were FREE. Others were priced between £3 and £30 with an average ticket price of £3.58 (compared to £7.46 in 2014) or £2.15 (compared to £2.24 in 2014) when the free events are factored in. The www.casaf.co.uk and www.nngt.uk websites were kept informative, user-friendly and up-to-date – with regular feeds to Facebook, Twitter and other social networking sites – by a professional communications/web manager and volunteers. Other tried and tested printed publicity (brochures, business cards, posters, indoor displays, roadside signs) and e-marketing tools were used to great effect. Monthly newsletters to COAST’s 500-strong e-distribution list featured upcoming events & opportunities; 7 daily newsletters were issued during festival week followed by a thank-you in the week after. The volume and content of editorial coverage was vastly improved on 2014 (mainly due to #NNGT’s “local interest” angle and COAST’s commitment to advertise this and other key events in various free local papers). There were several resulting features on Mustard TV and in Archant (EDP, North Norfolk News, Norfolk magazine), Just Regional and Times Group publications. Most events were attended and/or documented by a COAST rep. Comments were invited via websites, social media and e-newsletters. The feedback received was largely positive with the majority of contributors reporting benefits and/or expressing a desire to be involved in future initiatives. Fundraising Activities/Events e.g. a raffle, quiz, garden party, the Friends scheme, etc. COAST knew that 2015 would be a tough year, financially, in a challenging economic climate of ongoing public sector cuts with the resulting increase in demand, from a broader range of worthy causes, for private sponsorship and charitable grants. Its £7,800 reserves (built up over 6½ years) proved both a boon and, to an extent, a hindrance. Some potential funders cited “healthy” reserves as a reason not to support COAST2015; conversely the Reserves Policy allowed Trustees to allocate up to ⅓ of these funds – i.e. 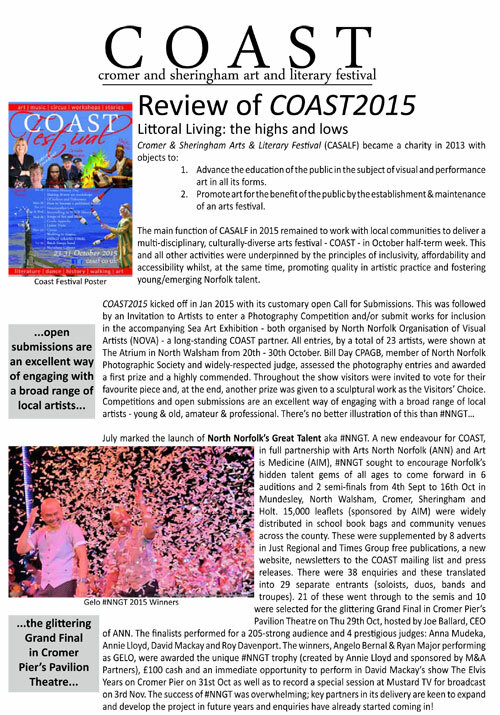 £2,600 – to the delivery of COAST2015 and the development of projects in 2016 (e.g. the community production of Les Mis). Without this “cushion” COAST’s future could have been in real jeopardy; with it, and the efforts of volunteers to diversify income, the impact of predicted losses was substantially mitigated. Given this financial landscape it’s a great achievement that COAST2015 looks set to make a loss of approx £984 with total predicted incomings of £12,323 and total predicted expenses of £13,307. Of the £12,323 income: £2,950 i.e. 24% came from grants; £1,925 i.e. 15% came from sponsorship; and £7,448 i.e. 61% came from self-generated earnings. COAST2015 was evaluated (in terms of its success in meeting aims, objectives & financial targets) by its Trustees at various meetings in Nov-Dec 2015. The consensus was that, given its track-record and large number of supporters, COAST should continue into 2016; with the recognition that there would need to be some significant changes – building on momentum and partnerships – to ensure sustainability and alleviate volunteer fatigue. Plans for a year-round programme, more closely aligned with ANN, AIM and other collaborators, would therefore be developed.